two words: je veux. these two basic pieces would be happily welcomed in my closet. 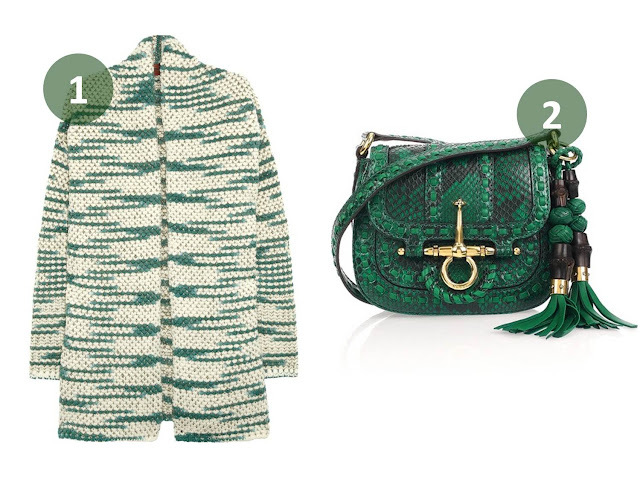 a large, chunky knit cardigan (it’s a missoni… they’re simply great when it comes to knit) and an emerald green, small shoulder bag (gucci, drool…). this color has got to be my favorite, forever (documented here, e.g.). but does it justify a major (fashion) splurge? probably not… but it will soon be christmas, haha, and you can always make a gift to yourself, entirely… (laughing-like-a-crazy-woman at this brilliant idea of mine). Christmas gifts for yourself are par for the course as far as I'm concerned! Love the cardigan! glad i found a partner in crime, chiara! what will it be for you, then?